Today's guest post comes from Jill Avis. 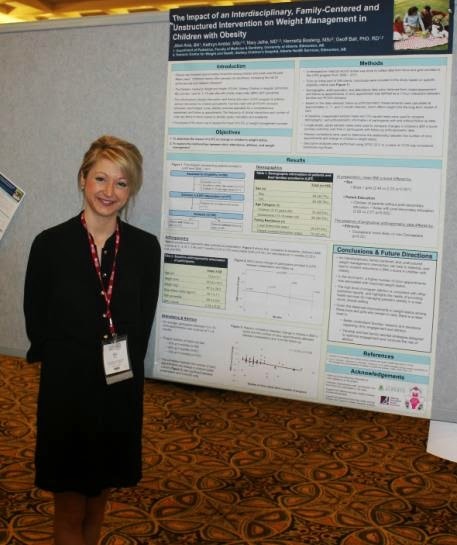 Jill is a PhD student studying under the supervision of Dr. Geoff Ball in the Department of Pediatrics at the University of Alberta. Her thesis work relates to innovative approaches for the prevention and management of pediatric obesity. Many readers will be familiar with an approach to behaviour change that has gained popularity in recent years – the nudge. This concept is well-described by Thaler & Sunstein as "the navigation of individuals toward optimal choices without restriction of other options" – in other words, ‘libertarian paternalism.’ For example, placing healthier food options in more visible, convenient locations in school cafeterias or altering the default option to consent for organ donation. Today, I want to talk about the nudges that work in counterproductive directions – what I call the ‘negative nudge’. Yoni’s blog post last Tuesday reinforced the reality that big corporations, (e.g., Coca-Cola) have the power to sway consumers toward food choices of questionable quality. Not only are we faced with a growing number of processed foods in our food environment, but portion sizes and product packaging have increased substantially, creating a ‘perfect storm’ that encourages us to eat more and more. When paired with the chance of a trip, keepsake “cup,” and a tacit endorsement by Coca-Cola, it is not surprising that people consume increasing amounts of unhealthy foods and drinks. In Thaler & Sunstein’s book, Nudge, the authors discuss dual process theory, which proposes two processes to explain our decision making - the rational, conscious system and the automatic, unconscious system. This theory may help to explain the disconnect between positive intention and behaviour; individuals who make an explicit pact to ‘shape-up’ or ‘be healthy’ (aka the rational system) face factors processed by the automatic system, which can inhibit adherence to their initial intention. Examples include temptation and mindlessness, or stickier influences, such as endorsements by big corporations. In our food environment, it is difficult to decipher which information is genuine and which is a marketing tactic. 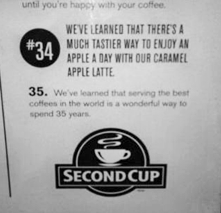 When I stopped in for my daily coffee at the local Second Cup, I took a double-take at one of their advertisements to celebrate 35 years in business; #34 states, “We’ve learned there is a much tastier way to enjoy an apple a day with our caramel apple latte.” Now, do I think that Second Cup had the purposeful intention of negatively influencing Canadians’ already poor eating habits? No. But I believe they are using their power for corporate benefit (profit!) by giving a ‘negative nudge’ to our food choices; share-holders and franchisees seem to be interested in their profit margin at the expense of individuals’ decision-making and dietary quality. This is just one example of the pervasiveness of ads that negatively nudge us – it’s clear we need more nudges that move us in the positive direction.